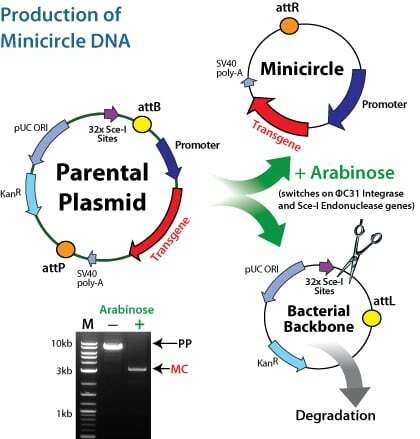 Minicircles are episomal DNA vectors that are produced as circular expression cassettes devoid of any bacterial plasmid DNA backbone. Their smaller molecular size enables more efficient transfections and offers sustained expression over a period of weeks as compared to standard plasmid vectors that only work for a few days. The Minicircle DNA elements are generated by an intramolecular (cis-) recombination from a parental plasmid (PP) mediated by PhiC31 integrase. The full-size MC-DNA construct is grown in a special host E. coli bacterial strain ZYCY10P3S2T (catalog#MN900A-1). This highly engineered strain harbors an Arabinose-inducible system to express the PhiC31 integrase and the I-SceI endonuclease simultaneously. The ZYCY10P3S2T strain also contains a robust arabinose transporter LacY A177C gene. Adding arabinose to the media turns on the integrase and endonuclease genes. The PhiC31 integrase produces the MC-DNA molecules as well as PP-DNA from the full-size MC-DNA construct. The Sce-I endonuclease then degrades the PP-DNA backbone. The Parental Plasmid DNA (PP) contains several engineered I-SceI restriction sites that ultimately lead to the destruction of the PP-DNA but not the MC-DNA. The difference between MC and standard plasmid vectors is that the MC no longer contains the bacterial origin of replication or the antibiotic resistance markers. Sequences within the bacterial plasmid backbone contain signals for methylation and transgene silencing. Thus delivering only the minicircles to cells lengthens the expression of the transgene over traditional transient transfections of plasmids. For dividing cells, expression of the minicircles lasts up to 14 days. For non-dividing cells, expression of the minicircles drops slightly after the first week, but then can continue expressing the transgenes for months. Parental minicircle plasmids and the ZYCY10P3S2T Producer Bacterial Strain are available for purchase by not-for-profit researchers only. Commercial users may purchase pre-made mcDNA [ready-to-transfect] only. SBI also offers custom parental plasmid cloning and mcDNA production to both not-for-profit and commercial end users; contact info@stratech.co.uk for additional details. For any other purposes, including the ability to buy the parental MC production system, commercial users should contact Stratech Scientific at info@stratech.co.uk for further information. Minicircles are easier to transfect into most cell types and expression can persist for weeks. 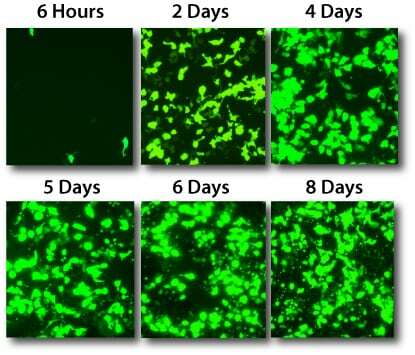 Below is an example of transfection of 1 ug minicircle DNA of the pMC.CMV-MCS-EF1-GFP-SV40PolyA (catalog # MN511A-1) construct using standard transfection protocols with HEK293 cells. Minicircle DNA can be transfected into animal models through tail vein injection procedures. 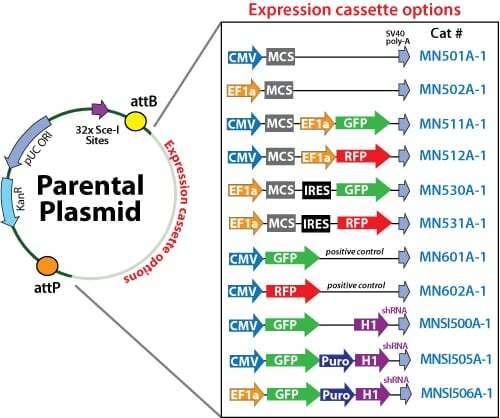 Expression of the transgene cassette is sustained for many months where typical plasmid DNAs are silenced within hours. Hydrodynamic tail vein injection of 40 ug minicircle DNA results in a slight drop after 48 hours but then stabilizes over time for persistent expression. Mix 40 ug minicircle DNA expression DNA in saline equal to 10% of the rodent’s body-weight (2 ml for a 20 g mouse). Inject into the tail vein rapidly (5-8 seconds). SBI has created a set of minicircle parental cloning vector formats to choose from. Select from CMV or EF1a promoters, GFP, RFP and Puro markers. The minicircle parental cloning shRNA vector formats feature either CMV or EF1a expressing the markers and a downstream H1 promoter to express high levels of the cloned shRNA sequence. 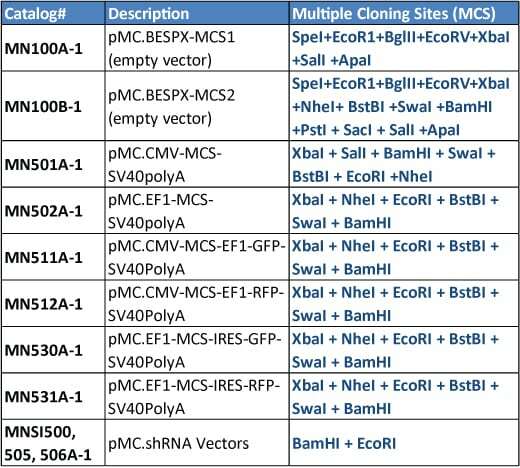 See the Table below for the particular MCS cloning sites for each of the minicircle DNA vectors. 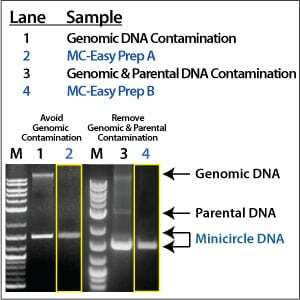 The MC-Easy system enables the simple, reproducible and efficient way to produce high quality Minicircle DNA for your experiments. The finely tuned growth and induction media produce minicircle DNA that is free of parental and genomic DNA contamination. The Kit also includes an additional, innovative method for degrading any contaminating genomic DNA using an ATP-dependent DNase reagent that will selectively remove linear genomic and residual parental DNA but will not affect the minicircle DNA. Clean and effective minicircles every time. The system comes complete with a special minicircle DNA transfection reagent, MC-Fection, that works well with most cell lines. Choose from the minicircle production kit that includes the engineered E. coli producer strain ZYCY10P3S2T (cat# MN920A-1) or select the minicircle production and isolation kit alone (MN910A-1). Jia F, Wilson KD, Sun N, Gupta DM, Huang M, Li Z, Panetta NJ, Chen ZY, Robbins RC, Kay MA, Longaker MT, Wu JC. A nonviral minicircle vector for deriving human iPS cells. Nature Methods. 2010 Mar;7(3):197-9. Osborn MJ, McElmurry RT, Lees CJ, Defeo AP, Chen ZY, Kay MA, Naldini L, Freeman G, Tolar J, Blazar BR. Minicircle DNA-based Gene Therapy Coupled With Immune Modulation Permits Long-term Expression of Î±-L-Iduronidase in Mice With Mucopolysaccharidosis Type I. Mol Ther. 2010 Nov 16. Huang M, Chen Z, Hu S, Jia F, Li Z, Hoyt G, Robbins RC, Kay MA, Wu JC. Novel minicircle vector for gene therapy in murine myocardial infarction. Circulation. 2009 Sep 15;120. Stenler S, Andersson A, Simonson OE, Lundin KE, Chen ZY, Kay MA, Smith CI, Sylvén C, Blomberg P. Gene transfer to mouse heart and skeletal muscles using a minicircle expressing human vascular endothelial growth factor. J Cardiovasc Pharmacol. 2009 Jan;53(1):18-23.